In this article get to know more about Printful, what services they offer and why you should start using the Printful drop shipping service to help you run a better t-shirt business. 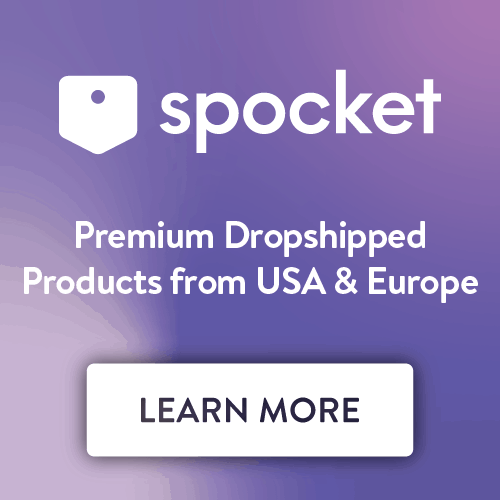 Printful is a Los Angeles, USA based drop shipping company that offers printing, drop shipping and fulfillment services for clothing items, accessories and homewares. They print or embroider your custom-made designs onto any of items they offer and then they ship your products directly to your customers via a fully automated drop shipping system that you can integrate with your own ecommerce platform. Printful is the missing link between your business and your customers that’s basically like a multi-skilled employee that just gets the job done. For a full look into Printful and what they do, check out this Printful Review. Printful works by completely executing your orders: they help you print your custom designs onto t-shirts and deliver them to your customers on-demand. 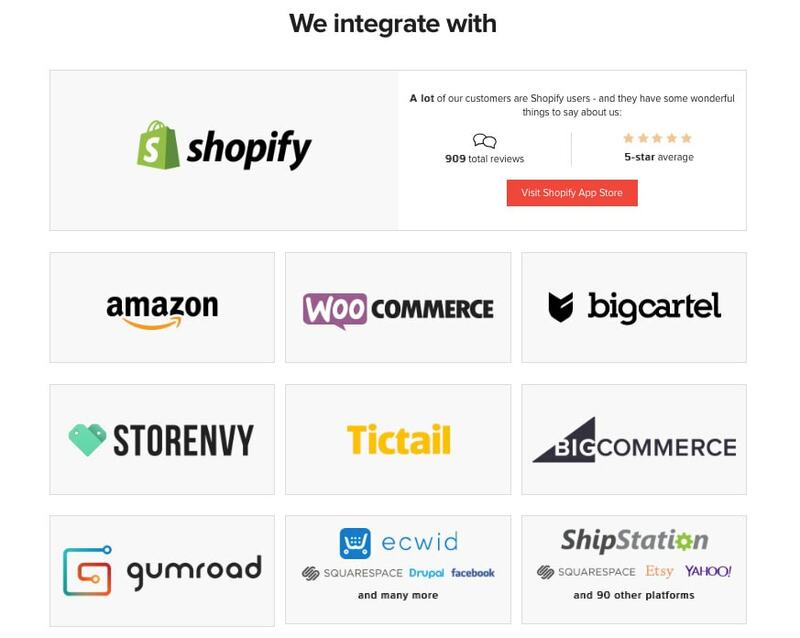 All you have to do is add Printful’s app integration to the ecommerce platform you use and you’ll be able to operate a fully automated business. Traditionally, if you operated a non-automated drop shipping business, you would have to do the printing, packaging and shipping process yourself and you’d have to manage all the associated costs: printer, ink, t-shirts in bulk, shipping packages and postage costs, not to mention the time and labour it would take to produce and ship the t-shirts . With Printful, however, your customers just have to place their orders with you and Printful takes care of the rest, and at a fraction of the cost since they already have the equipment, materials and logistics personnel to operate a t-shirt printing and fulfillment business. 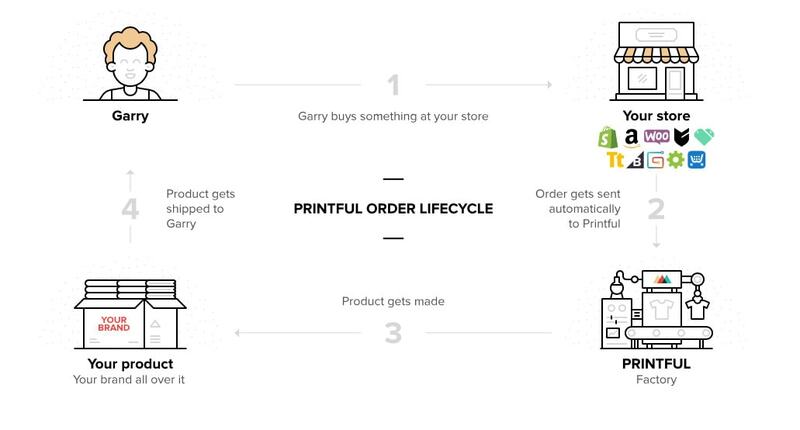 By drop shipping with Printful you’ll still get to keep the profit your business generates and you get to spend your time focusing on less of the logistical aspects of your business and on other aspects like customer service, creating new t-shirt designs, marketing and growth instead. If you’re new to the world of drop shipping, check out this post to learn more about it and what drop shipping is. 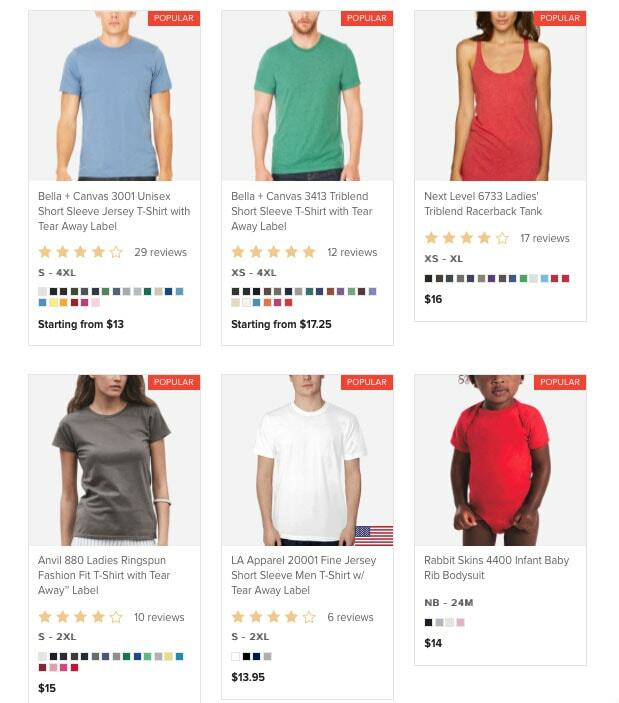 Printful offers a variety of t-shirt styles in a plethora of different sizes and colours from brands such as American Apparel, Anvil, Gildan, Alternative, Next Level, and Bella + Canvas. With the large selection Printful offers you can get your designs printed on any type of t-shirt style without limitation, which means you’ll end up with a finished product that matches your vision. Whatever type of printing you want done on any style of t-shirt, Printful will handle it for you. Equipped with a variety of the latest garment printing technologies such as direct-to-garment (DTG), all-over-sublimation, heat transfer and screen printing, Printful has the highest quality printing capabilities. Rest assured that your designs, no matter how complex, will be executed accurately. Since you’ll be drop shipping your products to your customers and not actually handling them yourself, Printful has ways to help you make your shipping packages look like they’re coming from you. The two main ways you can brand your packaging are by adding your logo to the outside of the package via a printed sticker, or you’re also able to create a custom packing slip that will be added to every package that ships out. Alternatively, you can add your logos to the back of your t-shirts (for an extra $3/shirt) so not only will your packages be branded, but your t-shirts can be as well. 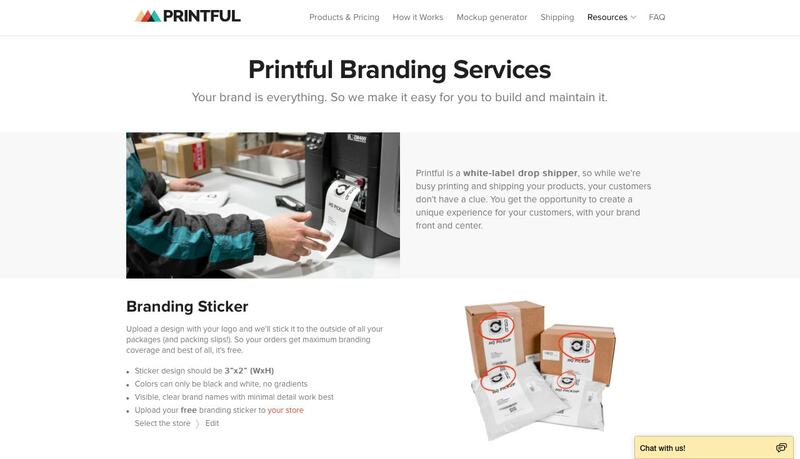 Check out the Printful Branding Services page for more information. 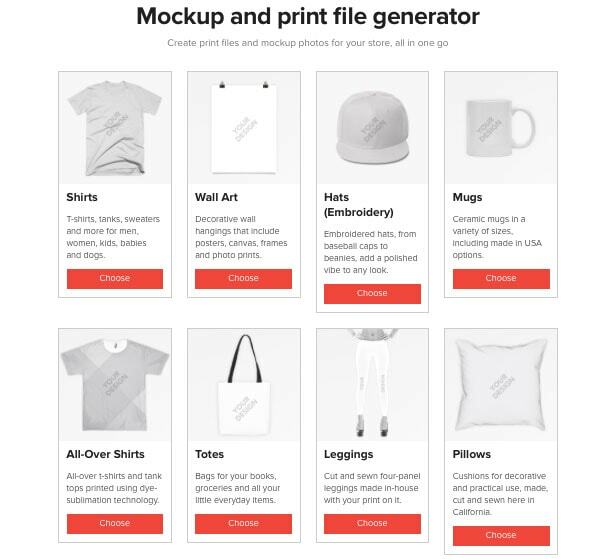 In order to make sure your t-shirts get printed the way you want them to, Printful supplies a Mock-Up & Print File Generation tool that you can use to digitally add your design to any of their t-shirt styles so you can get a vision of the final product before it’s actually printed. This is a really useful tool to use to gauge the layout and spacing of your designs, plus you can upload the mock up to Printful so their employees can use it as a reference any time their printing one of your designs. The tool is super easy to use, check it out here. With those integrations all you have to do is install the Printful app on whichever platform you use and your platform will be able to communicate electronically with Printful so you won’t have to manually place orders or send information, it’ll be done automatically. 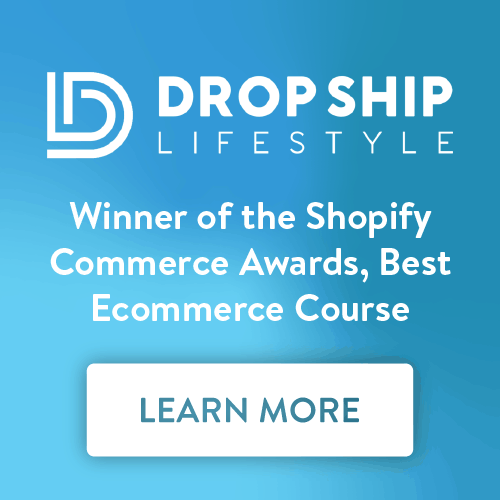 This makes the drop shipping your products even easier and you won’t have to worry about misplacing information or making mistakes with orders. Not every drop shipping service enables you to make your business completely automated so this is a huge advantage. Printful’s website is super easy to navigate with all the tools, information and resources you could ever need easily available to help you manage your drop shipping store with Printful. Whether you need to access an overview of your orders, look around at their product offering, check out their print guidelines and more, their website is laid out in a very accessible way so you’ll be able to find everything you need to operate a successful business with them. 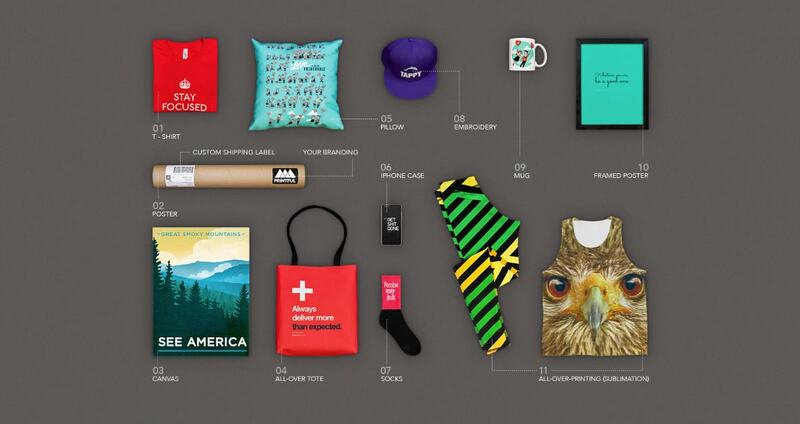 Once your products are created and packaged, Printful offers a complete and hassle-free shipping service. You get fair pricing, reshipment for damaged or lost items, as well as email confirmations and communication until your customer receives your product. Printful handles the ins and outs of the shipping process, all you need to do is supply them with a product to ship and an address to ship it to and they’ll get it there. They’re also very transparent about their shipping prices so there’s no surprises later for you or your customers. 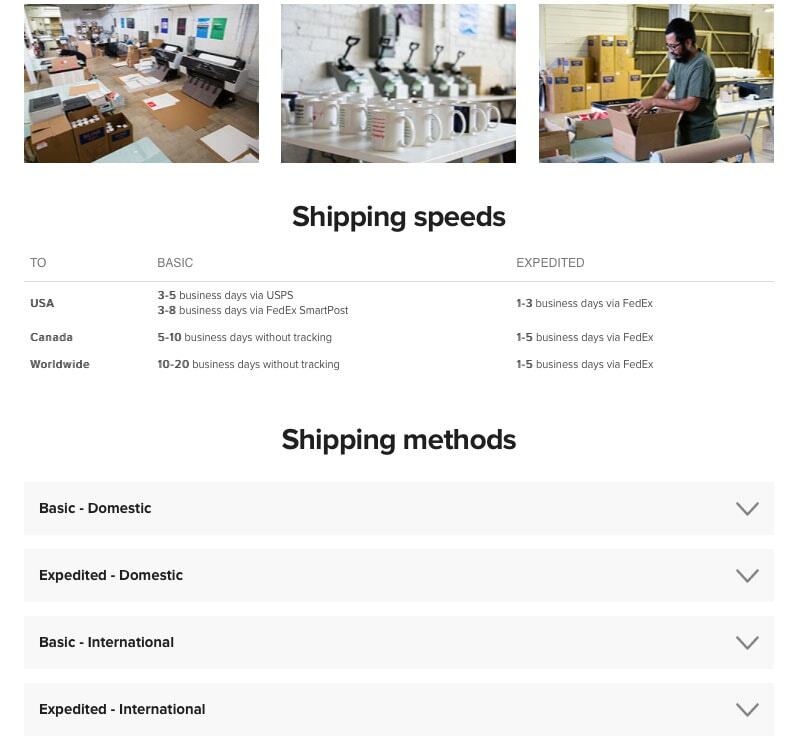 Read more about it on their Shipping Speeds & Pricing page. You’re new to the t-shirt business. If you were to handle the purchasing of materials and equipment, the hiring of personnel, as well as all the production, packaging, shipping and fulfillment, you would probably make a lot of mistakes before finally figuring out what works and what doesn’t. Printful has been in the game for a long time, so they’ve got it all figured out by now. Skip the growing pains and just outsource the difficult part straight to Printful so you can avoid all the hassles, headaches and mistakes that come with figuring all this out on your own. By skipping the growing pains and outsourcing to Printful you’ll be able to focus on the front end of your business and make sure that operates smoothly rather than worrying about the logistics. You will never have to pay a subscription fee, start up fee, membership fee, minimum orders, or anything along those lines with Printful. What you pay for are your own orders, when they get placed by your customers, and nothing more. Printful is very upfront with how much their services cost, including shipping and fulfillment, so check out their Products & Pricing page as well as their Shipping page to get an idea of what their services cost. Because Printful will be handling the actual printing and fulfillment of your products, you won’t have to actually see any of your t-shirts before they get sent to your customers, so you won’t have to manage any inventory. This is a huge relief off your shoulders as you won’t have to bulk buy t-shirts, you won’t have to worry about counting inventory, managing SKUs, selling out of inventory or ordering inventory as Printful manages that whole process for you. Printful has invested heavily in their customer support team to ensure that any issues you or your customers have are resolved quickly. The Printful team strives to make their platform easy to navigate, but in the event that you have a question, feel free to call, email or live chat with them to get your problem solved efficiently. 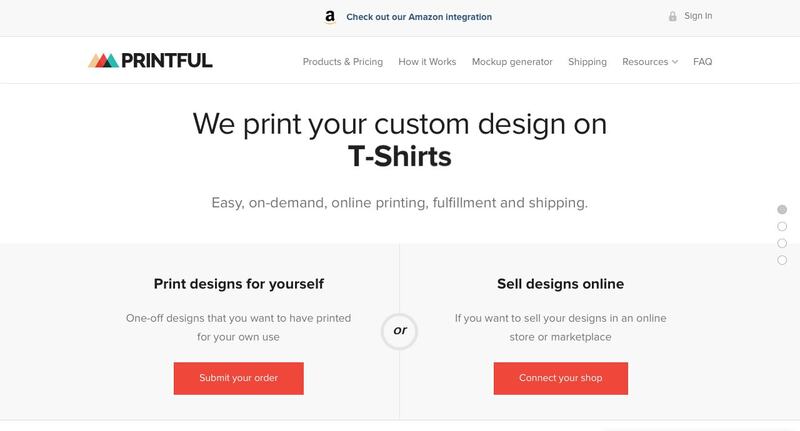 You might just be selling t-shirts right now, but maybe one day in the future you’ll want to expand your product offering. 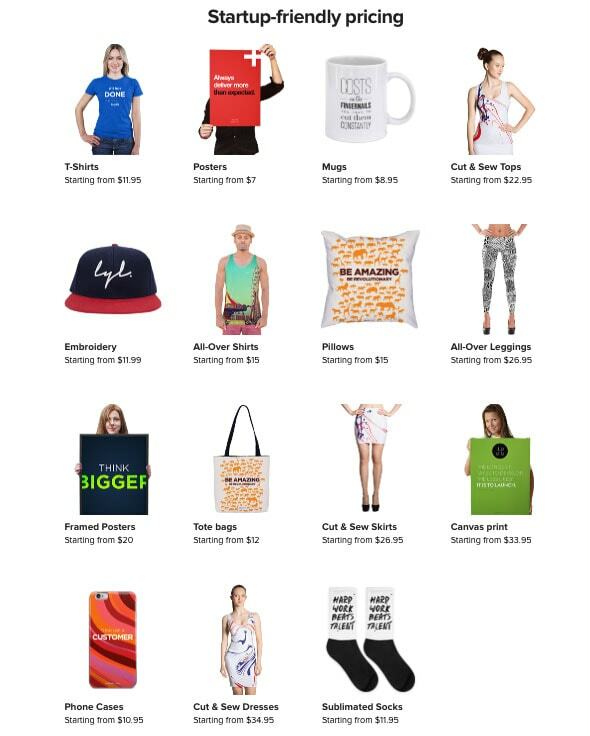 Luckily, Printful offers a huge selection of different product types including hoodies, zip ups, leggings, dresses, wall posters, mugs, throw pillows, hats, tote bags and phone cases. This means that you’ll be able to seamlessly expand the scope of your businesses, if ever you chose to, and you’ll be able to grow your fully automated business in whatever direction you choose. Check out their Products & Pricing page for more details on what exactly they offer. All of these aspects are hugely advantageous if you’re interested in starting your own clothing line. 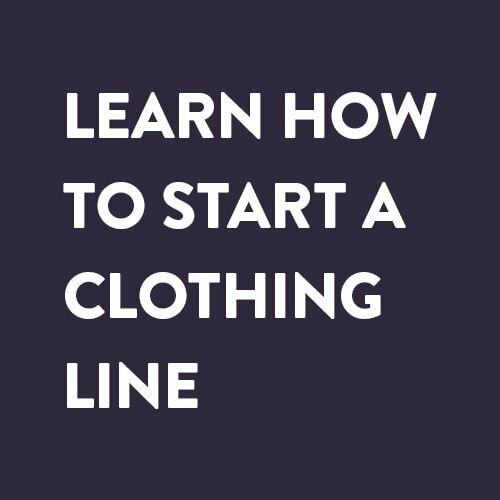 Check out this post for comprehensive, up-to-date and relevant information about how to start your own clothing line. If those 13 benefits don’t convince you to use the Printful drop shipping service for your own t-shirt business then we don’t know what will. If you’re already convinced, then great! Head on over to Printful and try their service for yourself. You’ll be able to see exactly how great their service is and start your own fully automated drop shipping business. We’re convinced you’ll be another one of Printful’s happy customers.